Weekday breakfasts are "have to", right? You're rushed and not all that hungry 'cause it's early but need to get some nourishment before you start the day and practically anything will do. We keep it super simple around here--mostly just toast or cereal or a quick fried egg. Weekends on the other hand--weekends are times to slow down a bit and savor the good things. Weekends are magical little respites from the franticness of Monday through Friday. Weekends are...a plateful of blueberry waffles with maple glaze. At least they are to Joy Wilson, author of Joy the Baker Over Easy: Sweet and Savory Recipes for Leisurely Days, creator of these fabulous waffles and my Famous Fridays pick for this week. If you're looking for something a little out of the ordinary to separate your weekend mornings from ordinary a.m.'s, today's the post for you! TGIF!!! Not only is Joy the author of Over Easy as well as two other cookbooks, but she's also the driving force behind the popular food blog, Joy The Baker. It's a terrific site filled with great recipes, stories and musings on life according to Joy. This latest cookbook is dedicated to leisurely breakfast/brunch eating and is filled with tons of ways to make the morning meal more delicious and special (though a lot of these would make great breakfast-for-dinner meals too.) There are chapters devoted to cocktails and coffee, eggs, the griddle, baked goods and more and while some recipes require a bit of work and advance planning, most are fairly easy, including these pancakes, which come together in no time. Can't wait to try her Shakshuka with Feta, Dad's Buttermilk Biscuits, Thin Overnight Pancakes and Chocolate Brioche Cinnamon Rolls, among other things. I just need more weekend time!! 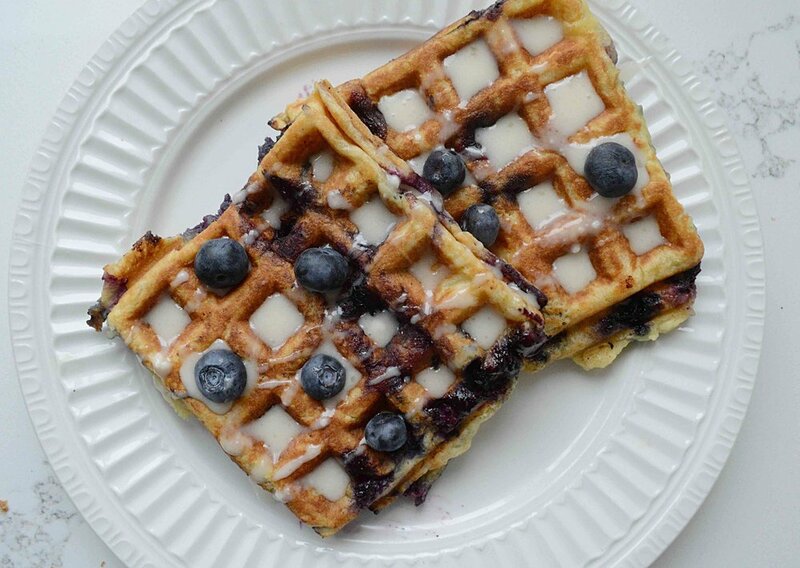 But today, it's all about these marvelous blueberry sour cream waffles. Light, fluffy and super simple, they're almost easy enough to make on a regular day but save them for the weekend so you have time to sit and savor every blueberry bite! And that glaze!! YUM!! Finger-licking good and not to be missed. Takes these from really good blueberry waffles to a BREAKFAST EXPERIENCE!!! And because the waffles themselves aren't really sweet and the blueberries add a bit of tartness, especially as they heat up and burst open in the waffle iron, the glaze adds just the right amount of sweet decadence. You could even make these for a brunch party, keep them warm in the oven and then serve them when everyone arrives with the glaze on the side for guests to pour on themselves. So pick up Over Easy and a pint of berries and make this last weekend of February (gasp) a memorable one. Hopefully we'll get a chance to sleep in and cook up something non-weekday for breakfast at least one of the days (the late-night Olympics schedule is killing us, even though we are loving watching it and so happy for the women's hockey team!!) Have a great and delicious weekend and I'll be back next week with some more tasty treats as we head into March!!! You will need a waffle iron for this. 1. To make the waffles: Preheat waffle iron. In a large bowl, mix the flour, baking powder and soda, salt and sugar with a whisk. Set aside. Preheat oven to 250ºF. 2. In a separate bowl, whisk the butter, eggs, vanilla, sour cream, and milk together until smooth. Pour into the dry ingredients and stir just until incorporated. You don't want to over mix so if there are a few little lumps, leave them alone. Stir in the blueberries. 3. I use a ladle to portion the batter onto the waffle iron--makes it a lot less messy. Cook the waffles until golden brown. Transfer to a baking sheet and place into the oven to keep warm. 4. While waffles are cooking, make the glaze: Whisk all the ingredients together in a small bowl until mixture is smooth and pourable. If it seems too thick you can add a bit more milk to thin it out. 5. When all the waffles are cooked, serve the waffles topped with drizzles of the glaze and more fresh blueberries if you like. Note: Recipe adapted from Joy the Baker's Over Easy: Sweet and Savory Recipes for Leisurely Days by Joy Wilson. I cut the glaze recipe in half because there just seemed to be too much. If you really like a lot of glaze, just double the recipe.